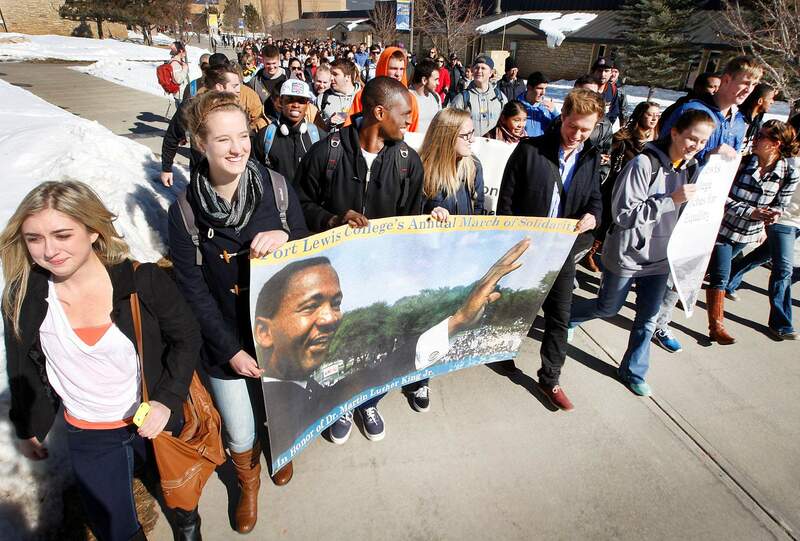 Hundreds of Fort Lewis College students, faculty, staff and others, marched from the Center of Southwest Studies to the Student Union Building on Monday during the annual March of Solidarity on Martin Luther King Day. In an effort to bring to light contemporary social and justice issues, this years Martin Luther King Day activities at Fort Lewis College included a Tunnel of Oppression. Caleb Ontiveros, sitting inside a cage made of wire fencing, was part of the enactment protesting factory farming. 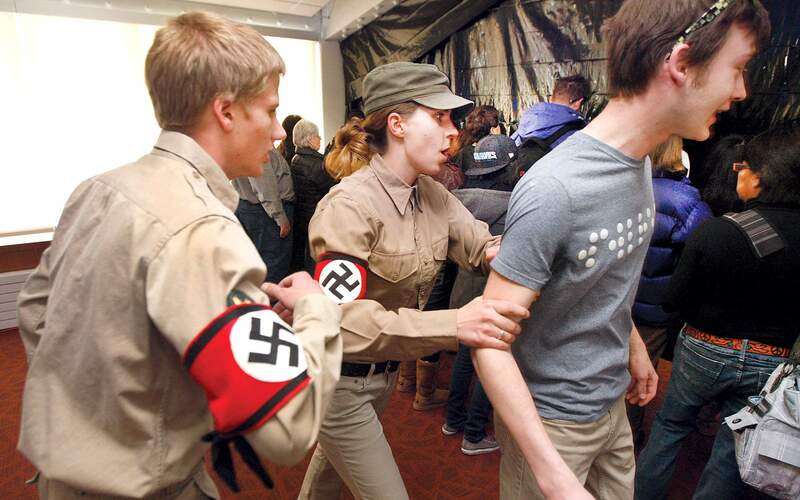 Spencer Edsall and Anna Jany, dressed as Nazis take away Rolf Hanning, who played the role of a Jew, while the rest of the group faces the wall during an enactment of genocide in the Tunnel of Oppression at Fort Lewis College on Monday. 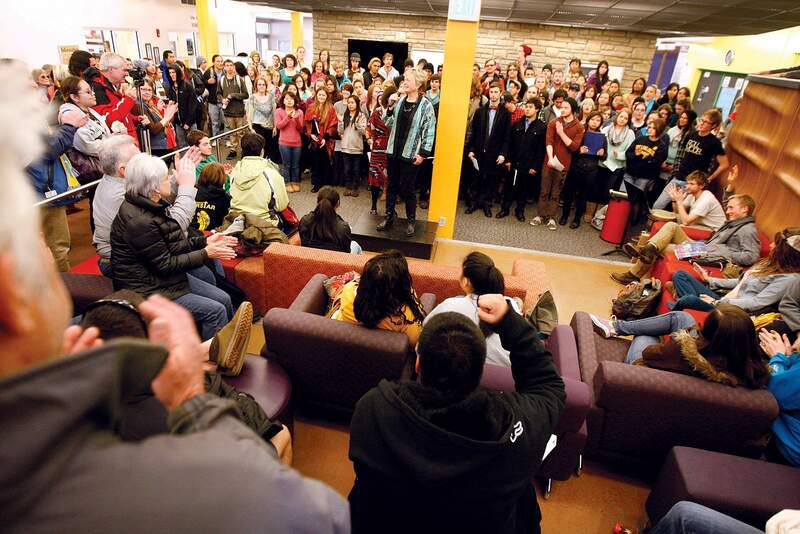 Fort Lewis College President Dene Kay Thomas speaks at the Student Union building on Monday after the annual March of Solidarity as part of the college observance of Martin Luther King Jr. Day. With formidable oratory, an instinctual grasp of political choreography and great self-possession  even intellectual generosity  in the face of hate, the civil-rights martyr Martin Luther King Jr. was not a one-trick-pony. On Monday, Fort Lewis College observed the national holiday that bears Kings name with a series of events as diverse as the reverends skills. More than 200 people marched from the Center of Southwest Studies to the Student Union Building, singing the phrase We are not afraid, as nonparticipating students gave marchers thumbs up. Inside the Student Union, FLC President Dene Kay Thomas delivered a rousing speech about college values and the vibrancy of campus campaigns for social justice before hundreds, many straining to glimpse her, their view obstructed by masses of tightly packed bodies. Using a recent string of hate graffiti, scrawled in buildings and on sidewalks as examples, Thomas denounced the swastikas and anti-gay slurs that have marred the campus. I know today we still have incidents  people who feel threatened, acts of hate committed through writing and other ways. I submit to you that people who commit acts of hate are not free themselves, said Thomas, whose statement was met by whoops and applause. Before Christmas, students reported three separate instances in which swastikas  the still-potent symbol of the Third Reich and the Holocaust  were scrawled on college and student properties. Despite administrators hopes and student protests, the string of hate graffiti has not abated. FLC Spokesman Mitch Davis said a student found an anti-gay incitement to violence inside an FLC bathroom on Sunday. Davis echoed Thomas in saying such incidents remind the student body that Kings dream of equality for all remains far from realized. Some students said the graffiti  while disturbing  distracted from deeper issues of race at FLC. Freshman Briana Cramer said she hasnt encountered any overt racism or sexism at FLC, but she was troubled by students tendency to self-segregate according to race. In classrooms, you see students of color and white students. They definitely sit apart, Cramer said. After Thomass address, the Fort Lewis College Concert Choir sang civil-rights ballads with the conviction of melancholy angels. None of this could prepare participants for the Tunnel of Oppression  a boldly imagined collection of interactive artwork highlighting the myriad ways people suffer oppression in modern society. The artwork had attracted about 100 students, who stood waiting in line to be guided through enactions of oppression so visceral that everyone had to sign a disclaimer on entering. Inside the exhibit, one woman started crying when confronted by a scene labeled factory farming, in which a young man, imprisoned within a fencing-wire cage, his mouth taped shut, stared blankly. Behind him were photos of livestock fated to become our food. In another room, Nazi guards sprung forward, ordering the tour groups to back against the wall with terrifying menace. On abducting one group member, who they hustled behind an enormous black plastic curtain, gas suddenly shot from a corner of the room. The tour was told it had just become one of the Jews exterminated in the Holocaust. Though the Tunnel of Oppression was a contemporary memorial to MLK, focusing on issues that dominate todays newspapers such as immigrants rights and racial profiling, many FLC students were content to pay old-school homage to King and the campaigns of his time. At the open-mic rally in the afternoon, students and faculty honored every-day heroes  with one woman delivering a benediction to her husband while another lauded the quiet heroism of lunch ladies. One young man stepped forward, introducing himself as the president of Feminist Voice  a group at the college that is devoted to spreading awareness of feminism  before singling out his grandmother as his hero. As he talked of her unabashed liberalism, two black athletes nodded appreciatively, as did a white janitor who decided to spend his break listening to student speakers discuss inequality. The photograph was in stark black and white, whereas the students clustered around it  thanks in no small part to King  were experiencing life, education, history and the ongoing fight for social equality in Technicolor, fully awake.